You are at:Home»April»April 9»April 9, 1948: Freedom Fighter or Terrorist? On April 9, 1948, events in Palestine brought to the forefront the adage that “One man’s freedom fighter is another man’s terrorist.” (An adage of uncertain origins, but dating back well over a century, or more.) On that fateful day about 120 Zionists from the Irgun and Lehi groups attacked a Palestinian town called Deir Yassin outside Jerusalem, killing about 107 of the Palestinian inhabitants of the village of only 600. In the massacre, 4 Zionists were also killed. 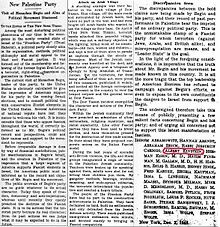 The Civil War in Palestine conducted by Jewish Zionists (those intent on establishing a Jewish state in the traditional Jewish homeland of Israel) against the British colonial overlords of Palestine was being waged largely as a guerilla operation and included the targeting of Muslim Palestinian neighborhoods. The background situation casting its long shadow over events in Palestine was World War II and the “Holocaust,” the wholesale slaughter of Europe’s Jews by a deranged German regime. Jewish nationalists (aka, Zionists), strove to create a Jewish Homeland in Palestine/Israel, a nation of their own that Jews would be safe from the frequent historical pogroms and slaughters of Jews, not to mention varying degrees of discrimination against Jews almost everywhere in the world. Was the action at Deir Yassin a massacre or part of a justifiable war? History provides many examples of struggles by oppressed people against a larger and more powerful government that have alternately been called terrorist movements or fighting for freedom, depending on the point of view of the person reporting on the events. Certainly, the British considered the American rebels to be terrorists, or at least illegal dissidents and criminals, traitors to the Crown, while of course we revere the Founding Fathers as the architects of freedom in America. Islamic extremists that commit acts of terror against the United States, Russia, or other powers (including Islamic majority states that fail to live up to the extremists’ view of Islam) believe that they are fighting for the “freedom” to worship their God in the manner they believe is correct. American home grown terrorists, such as the ones that attacked the Federal Building in Oklahoma City in 1995 believe they are fighting a David vs. Goliath battle against the US Government that is oppressing the people of the United States instead of allowing Americans to practice the brand of freedom these extremists think we all (or at least they) should deserve. European/Americans considered Native Americans that fought against White expansion into the North American continent to be “renegades” and “savages,” not legitimate freedom fighters defending their own land. Surely the Native people saw things differently! Critics of the adage we quoted in the first sentence of the article claim that this particular saying is trite and ridiculous, that there is plenty of reasonable opportunity to divine whether or not a person or group is acting with legitimate cause or merely acting in a criminal, vengeful, vindictive, or misguided way, i.e., a terrorist way. Israeli commandos certainly thought they were on the side of “right” when they went about killing (you can call it “murdering” if you do not agree with the action) those people responsible for the terrorist murders at the 1972 Munich Summer Olympics. Those Mossad secret agents ended up killing at least 1 innocent person by accident. One of the most reproduced photos taken during the siege shows a kidnapper on the balcony attached to Munich Olympic village Building 31, where members of the Israeli Olympic team and delegation were quartered. Photograph by Russell McPhedran. While we certainly form our own opinions about various people, groups, and actions, as to whether or not their character is terrorist or freedom fighter, we decline to rant publicly about those opinions. Instead, we ask you, our valued readers to utilize your considerable talents and experiences to expound on the subject and give us your own definition of when a person or action is terrorism as opposed to legitimate freedom fighting. Questions for Students (and others): Is terrorism justified when fighting against an unjust power? Is it right to take revenge against terrorists? Is it right to take revenge against a government or other entity or people that have committed an unjust act or acts? Can terrorism really be defined? (If so, how?) Please let us know in the comments section below this article. Freeman, Charles. Terrorists or Freedom Fighters. B T Batsford Ltd., 1990. Klein, Morton. Deir Yassin: History of a lie. Zionist Organization of America, 1997. Milstein, Uri. The Birth of the Palestinian Nation: The Myth of the Deir Yassin Massacre. Gefen Publishing House, 2012. Pappe, Ilan. The Ethnic Cleansing of Palestine. Oneworld Publications, 2007. Suarez, Thomas. State of Terror: How Terrorism Created Modern Israel. Interlink Pub Group, 2016. Next Article Famous London Landmark is an Imposter!